The pace of change in home care is accelerating at a high rate, and demands for caregiver time and skill are unrelenting. Nowhere is this more apparent than in the home infusion therapy market -- a rapidly growing mainstay of home and clinic care expected to reach $31.9 billion USD by 2022. An aging population and the resulting rise in chronic disease has led to the increasing demand for infusion therapy outside of a hospital setting. For patients with acute, high-risk conditions or who are immunocompromised, medications must often be delivered intravenously. Not only is it a cost-effective option to treat patients at home or in a clinic setting, but such settings provide greater comfort for patients and keeps them safer (each hospital visit dampens one’s prognosis). Yet this brings about a new set of challenges for home care providers, who must keep pace with the demand and with legislation. In fact, the 21st Century CURES Act, which President Obama signed into law in 2016, added many stipulations to home infusion services. For example, Medicare payments are now at a rate closer to actual drug prices. The legislation also includes a provision to reimburse for the services of administering home infusion, which is set to begin in 2021. Lawmakers are working to address this to ensure people who need infusion can continue to access it. Yet regardless of where new legislation lands, demand continues to grow. Is your agency prepared to meet it? Through technology, agencies can keep pace with change. Most importantly, agencies must choose a flexible solution that can roll with the tide while meeting your current needs. Eliminating paper: Paper-based client records and other forms of manual documentation are not only outdated, but inefficient for an agency. With home health care, one of the most documented and regulated industries, it’s easy for countless hours and thousands of dollars to be lost that could instead be spent on improving patient outcomes. 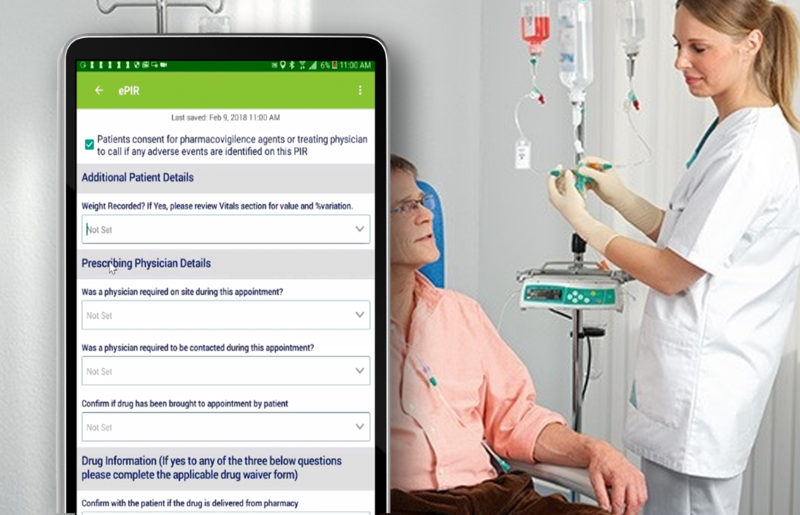 Paperless care means major cost savings and heightened efficiency, particularly when agencies juggle a full client roster and time-consuming services such as home infusion. Tracking and managing care time vs. ongoing time: Care time (when staff are actively treating or visiting patients) and ongoing time (when, for instance, a nurse must wait with a patient during and after a treatment) are two aspects of infusion therapy that can ignite scheduling headaches. Your software solution should track the difference between care and ongoing time so, for example, a nurse can monitor one or more patients while actively caring for another to maximize utilization. Schedule and route optimization: Caregiver shortage is a reality, so it’s important to maximize the time your caregivers have to visit and remain with patients. That’s especially true for infusion, which can be a time-consuming endeavour. Having software that optimizes schedules and routes can cut travel time by 30 per cent -- an efficiency that benefits client, caregiver, and agency. AlayaCare always aims to sit at the forefront of innovation in home health care technology. Our-end-to-end cloud-based solution features end-to-end planning, clinical documentation, mobile care worker functionality, and more. Contact us to find out how we can help your agency remain at the ready now and into the future.